Two research groups from the Centro Nacional de Análisis Genómico (CNAG-CRG) of the Centre for Genomic Regulation (CRG) with expertise in genome sequencing technologies and single-cell genomics led by Ivo Gut and Holger Heyn, and two research groups from the Institut d'Investigacions Biomèdiques August Pi I Sunyer (IDIBAPS) with expertise in cell biology, pathology and clinic led by Elias Campo and Iñaki Martin-Subero, have been awarded with an 8,3 M€ grant in this call. These researchers will develop the [email protected] project, which aims at resolving the genomic and epigenomic hallmarks of chronic lymphocytic leukemia using single-cell analysis. "We will be able to disentangle chronic lymphocytic leukemia with far greater resolution than ever before and generate comprehensive information from thousands of individual cells. This will undoubtedly lead to novel insights into the origin and evolution of cancer," says Ivo Gut, director of the CNAG-CRG. "Our groups have been working together on chronic lymphocytic leukemia since 2009. We have come a long way in our understanding of the genomic features of this disease. 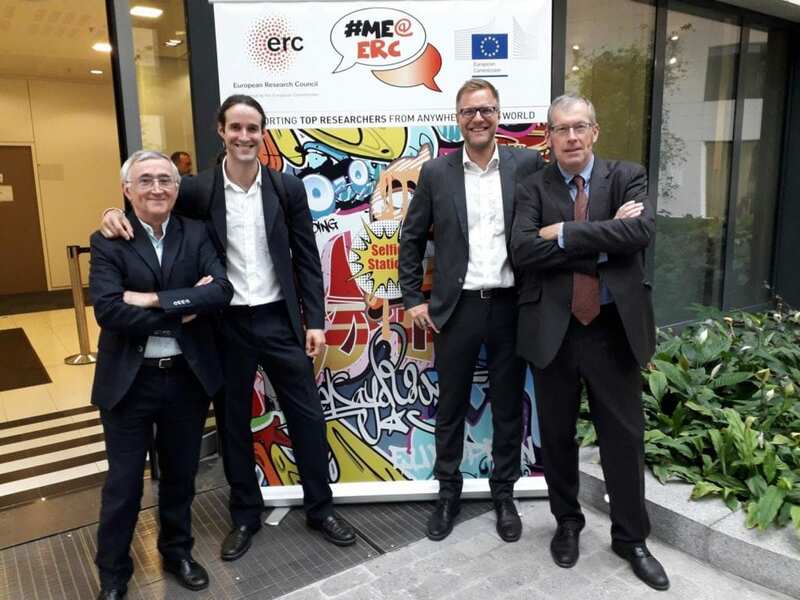 Now, the ERC Synergy grant will allow us to take another huge step forward in the understanding of chronic lymphocytic leukemia development and progression by comprehensively studying it at single-cell resolution," he concludes. The [email protected] project is one of the three awarded projects in Spain in this call the only one in Catalonia. It is one of the 27 granted projects throughout Europe, among the 295 submitted proposals with a 9% success rate. Over the last years, the groups collaborating in this project have already characterized the molecular features of normal B-cell subpopulations and of pools of leukemic cells from chronic lymphocytic leukemia patients. "Our previous work has revealed that there is an ecosystem of cancer cells in chronic lymphocytic leukemia and now we need to characterize this diversity of cancer cells" explains Elias Campo, director of the IDIBAPS. These cancer cell subtypes are related to different B-cell maturation stages, and every single cell can be relevant to predict the evolution and outcome of the disease in every patient. "Variation between B-cells is dynamically modulated during the course of the disease, and it has deep implications in its biology, clinical aggressiveness and treatment responses," adds Iñaki Martín-Subero, group leader at IDIBAPS. The [email protected] researchers will apply cutting-edge single-cell methodologies to comprehensively dissect the maturation and differentiation of B-cells, and their transformation to chronic lymphocytic leukemia. The [email protected] project joins four groups with complementary expertise in B-cell biology, clinical aspects and pathology, genomics, transcriptomics, epigenomics, sequencing technologies, single-cell profiling and computational biology, to decipher the genesis and molecular anatomy of chronic lymphocytic leukemia during the entire course of the disease. "We will generate genetic, transcriptional and epigenetic maps of hundred-thousands of single cells across locations, time points and individuals. New technologies in single-cell genomics will provide this individual information that we are now missing in order to better predict the course of the disease as well as to better target treatment," explains Holger Heyn, team leader at CNAG-CRG.